Enter the world of the internationally bestselling Iron Fey series. Dangerous faeries. Heartbreaking romance. Thrilling action and limitless adventure. The world of the fey has never been so powerful. 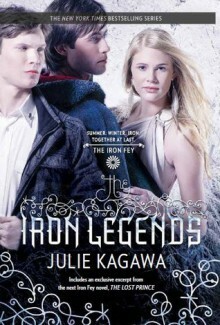 This collection includes three novellas set in the world of the Iron Fey plus the Guide to the Iron Fey with exclusive information about Julie Kagawa's unforgettable world of Faery.Winter's PassageNever make a promise to a faery. They always come to collect. Now Meghan Chase must fulfill her promise to Prince Ash of the Winter Court and embark upon a dangerous journey into the heart of enemy territory—while being pursued by a relentless new foe and guarding her own foolish heart.Summer's CrossingWhat can turn enemies into reluctant allies? A call from the Exile Queen, Leanansidhe, ties legendary prankster Puck to his archenemy, Prince Ash, on a journey that may end in betrayal and will set them both on an irreversible path.Iron's ProphecyBefore she ever knew what she might become, Iron Queen Meghan Chase was warned by the oracle that her firstborn child would bring nothing but grief. And even as Meghan and Ash celebrate their long-awaited union, the prophecy stirs.…Three Iron Fey novellas for the first time in print! Three stories and background information about the series.Honestly the Tir na Nog thing drags me out of the story to be honest, but it's an interesting series. The three stories are somewhat filler about the series and interesting but not necessary to follow the series. Finished just in the nick of time. Like an hour ago. FINAL BOOK OF 2012! Oh my god, oh my god, oh my god, OH MY GOD!!! !After iron prophecy I definitely need to read the lost prince!! !OH MY GOD!!!! Just had to read Iron’s Prophecy – and I wonder what the oracle proclaimed in that would actually happen in next books of the Call of the Forgotten since The Lost Prince had none of it (maybe the end of it was a bit like it but it wasn’t what the Iron’s Prophecy suggested).